LONDON (Reuters) - The iconic black dress worn by Audrey Hepburn in the 1961 film "Breakfast at Tiffany's" will go on sale in December with an estimated price tag of 50-70,000 pounds ($90-130,000), Christie's auctioneers said on Wednesday. The dress, designed by Givenchy and worn by Hepburn in the memorable opening scene of the classic romantic comedy, is being auctioned on behalf of the City of Joy Aid charity which helps underprivileged children in India. It is the star lot of the annual film and entertainment sale at Christie's, in London's upmarket South Kensington, held this year on Dec. 5. Hepburn, who plays Holly Golightly in the movie, emerges from a cab onto a deserted, early-morning 5th Avenue in New York and peers through the window of jeweller Tiffany's while she eats her breakfast from a brown paper bag. The black dress worn by Audrey Hepburn in Breakfast at Tiffany's is to be auctioned for a charity which helps under-privileged people in India. 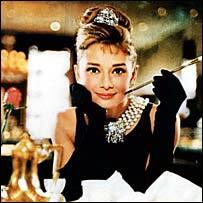 The outfit was designed by Hubert de Givenchy, who was in charge of Hepburn's wardrobe in the 1961 film. The actress played Holly Golightly and is seen in the dress in the opening scene as she emerges from a taxi. It is expected to fetch between £50,000 and £70,000 when sold by Christie's in London on 5 December. Hepburn was born in Brussels in 1929, and died from colon cancer at the age of 63. She had spent her later life concentrating on humanitarian work, including a role as a goodwill ambassador for Unicef, which began in 1989. Breakfast at Tiffany's was adapted from a novel by Truman Capote and also starred George Peppard, Patricia Neal and Mickey Rooney.